It’s a bird… it’s a plane… Nah, it’s just a brown pelican named Nigel. In my last post, I talked about some goals I had and one of them was to finish artwork I started last year (and the year before, and the year before that, and so on). Well, the brown pelican will be the first colored pencil that I should get done. This is the first of two posts that I will write about the progression of this bird illustration. 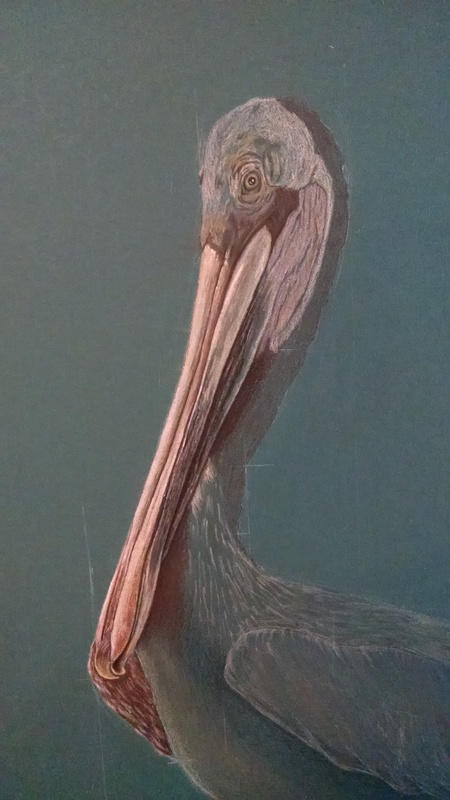 Six months ago, I started adding color to the brown pelican drawing I did last year at this time. And yes, I have decided to name this pelican — he shall be called Nigel (of Finding Nemo fame). Nigel resides in the Field Museum’s North American Bird Hall exhibit (photo below). I decided to use the same pencils I used on the Snowy Owl; Derwent colored drawing pencils which are a non-wax based pencil with a smooth, creamy texture (read aloud sultry commercial voice, LOL). Although, some people thought I was crazy for using something that only has 24 colors in it’s color range, I found it to be very calming knowing I didn’t have to search for the perfect colors. I was able to just use the 24 I had and mix them to get the tones of what the snowy owl showed on the mount. Okay, enough of that. Back to Nigel, the little brown pelican. I started with the outline. I used an aqua green colored matte board as my ground. I have come to love working on matte board and have also found that I can seek out matte board scraps at any art, craft, or hobby shops framing department. More likely it’s just an unhealthy relationship with matte board that I crave when I go to these stores. But back to the matte board. I like the durability of it the most; it stands up to erasing, is hard to bend and just looks really nice. For any dark colored board or paper, I use a white pencil and this drawing was no exception. So, now the best thing I did was just to start the sketch, then I moved onto my regular routine of “measuring, crawling, measuring, crawling” to get the portrait just right. 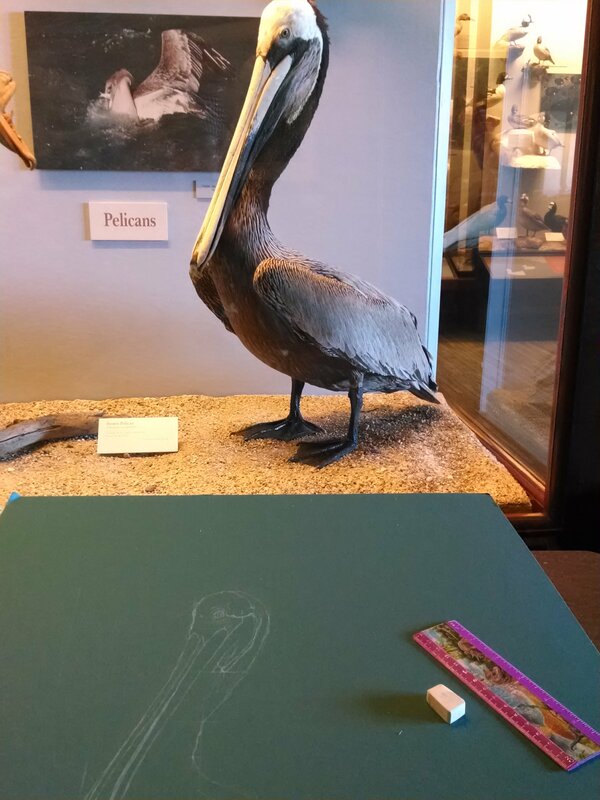 Drawing the brown pelican in the exhibit with the pelican mount. Yes, that is a six inch pink dinosaur ruler I use to line out my drawing. Start with the eyes and work around the head. Finished sketch before starting color. Once I finished the outline, I started adding color. I am using that same color range of 24 colored pencils which is a limited palette but I like the challenge of layering the colors to achieve the final result. I started with a thin, light layer of color over almost the whole sketch. I like to look for colors that you would not naturally see within the subject for that reflective effect when more colors are added on top. This is what the underlying layer is used for in all my illustrations; those unusual colors that you may not see in the object become incorporated into the picture to not only enhance what you see but create that visual life-like feel to the animal. Closeup of the face with the first layer of color. So, with this glorifying statement of how I LOVE doing detail work, Nigel has become one of my favorite birds to work on. I started the detail by slowly adding more color to fill in the shaded and lighter areas of the pelican. For any other piece, I would normally work over the whole thing during this process. However, the elongated dimensions of the pelican make it a bit daunting so I decided to start at the top and work my way down. I cannot stress enough, the detail is always the best part because this is where the drawing and underlying colors come together. Detail started on the head and beak. So, I will leave you now until I finish the piece within the next month. I hope you all enjoyed this post and also learned a little something about the drawing process (and how much I LOVE detail work, LOL). Until next time, CHEERS! Coming in Part 2: How on earth does Nigel the brown pelican look so realistic? It’s all about the proportions, color and DETAIL! Stay tuned.